Have you seen the new 2018 badge? Wondering why its red and why it bears a sword and a dragon? 2018 marks 100 years of Rovering both worldwide and in South Africa! Rovers began when older Scouts wanted a programme that was more appropriate to their age and ability. They wanted to continue reaping the benefits of Scouting, but at a more advanced level. In 1916 pilot programmes were implemented with older Boy Scouts and, in 1917 pamphlets were distributed to explain what Senior Scouts were. Senior Scouts had to be over 15 years of age, and as a rule, had to form a Senior Scout Patrol in connection with their own Troops. It was not until 1918 that the Senior Scouts became the third official section of the Boy Scouts and Senior Scout Troops were established. 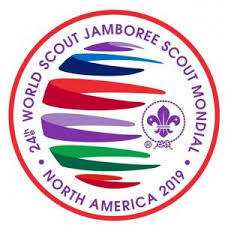 The name Rover Scouts was officially adopted in 1918. The Rover Programme was based upon the Arthurian Legend of Knights and Chivalry. 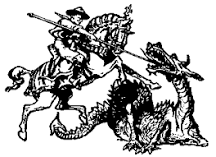 The symbol of St. George, Patron Saint of Scouts, was important to Baden-Powell. He believed that St George was the epitome of selflessness and both moral and physical courage, qualities which Baden-Powell saw as being among the aims of Scouting. The Dragon – Represents the symbol of St. George, Patron Saint of Scouts. When he was faced with difficulty or danger, however great it appeared, even in the shape of a dragon – he did not avoid it or fear it but went at it with all his power. That is exactly the way a Scout should face a difficulty, no matter how great or how terrifying it may appear. They should go at it boldly and confidently, using all the power that they can muster to try and overcome it, and the probability is that they will succeed. The Sword – Most Crews today either have a sword or knob kerre or similar symbol, this is by no means a weapon of the Crew, but a symbol representing the strength of the Crew. This symbol is often used in Rover ceremonies to emphasize this meaning. Inverted 100 – This number has been stylised with the number 8 to advertise the Rover centenary. Are you 17 ½ years old and keen to find out more about Rovers? 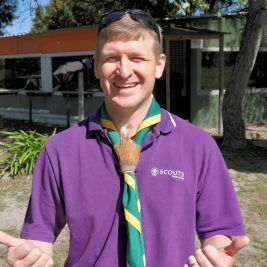 Email info@scouts.org.za, with the reference Join Rovering?